Updated as of 6:02 p.m. on July 18, 2018 | Both the House and Senate have released their chambers’ plans for gaveling in during 2018. Roll Call combined those schedules into the calendar below. The Senate will return for the second session of the 115th Congress on Wednesday, Jan. 3. The House updated its calendar on Friday, Dec. 22 to push back its arrival back in town from the Christmas break to Monday, Jan. 8. The House plans to be out of town for three full weeks ahead of Election Day on Nov. 6 (and four weeks total around the election), while the Senate plans to recess for two weeks around the midterm. The Senate is scheduled to be in session dozens more days than their colleagues across the Capitol Rotunda. 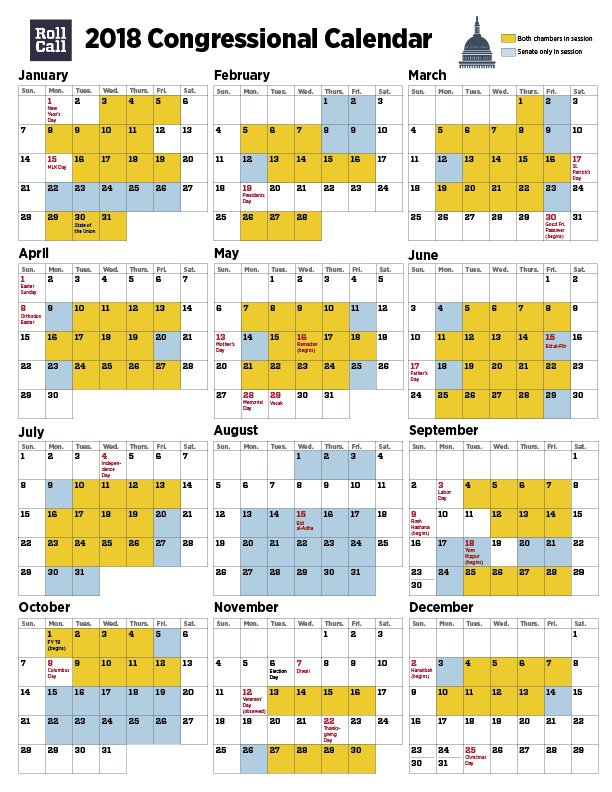 The House has plans to work 24 fewer days than its 2017 schedule. It is common for the chambers to adjust their schedules during election years to provide time for campaigning. You may download an updated copy of the calendar here. This calendar has been updated to reflect significant changes to the Senate calendar in the month of August. Those changes appear in the above link and image. Andrew Menezes contributed to this report.